Visiting the hill tribes of northern Vietnam is an unforgettable experience, but most villages can only be reached on a day or multi-day hike. 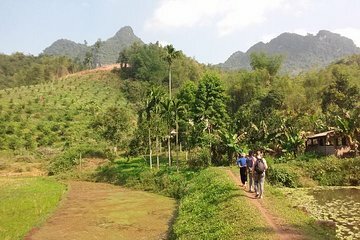 Instead, opt for this full-day tour of Hoa Binh and Giang Mo village from Hanoi and experience the unique lifestyles and cultural traditions of the Muong hill tribe. Tour includes hotel pickup, drop-off, and lunch. Begin your day with morning pickup from your central Hanoi hotel and soak up the scenery as you journey west into the hills of Northern Vietnam. After a scenic drive, stopping along the way to admire the dramatic mountain landscapes, arrive at the hydro power plant in Hoa Binh. Jump out to snap photos of the mighty lake and listen as you guide explains how it became the 6th-largest hydro power plant in the world. Continue to nearby Giang Mo Village, home to the Muong hill tribe, and spend time learning more about the unique culture and ancient traditions upheld by the Muong people. Enjoy a glimpse of daily life as you peek into a family house, meet the locals, and tuck into a delicious Vietnamese lunch in a traditional stilt house. You’ll have free time to explore the village independently before traveling back to Hanoi, stopping along the way to visit the Ho Chi Minh Trail Museum.